Torchlight developer Runic Games is working on a brand-new game called Hob, an interactive adventure without text or dialog. Instead, the story will be revealed through gameplay set on a strange world filled with alien life and mysterious machines. "The more players delve into the world’s design, the more they uncover a planet in peril. Players must learn to survive, understand their true purpose through acquiring skills, and ultimately transform the nature of the world itself," Runic wrote in the announcement of the new game, which doesn't actually say very much about it at all. "Narrative is revealed as players explore and interact with their mysterious planet, and the strange life forms that inhabit it." Want to know more? 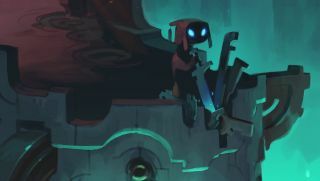 There's a brief teaser above, some screens below, and an article at Polygon in which Runic President Marsh Lefler said Hob is inspired by games like Ico and Shadow of the Colossus. "The sense of awe and wonder. Where am I? What is going on? I don't understand," he said. "You get a narrative by playing the game. That's the one thing we absolutely loved and we all talked about trying to do that. Making a world that seemed alien, and playing the game explained that story." And even though it's not, as far as I know, related to Runic's previous Torchlight games, their success—Torchlight has an 83 score on Metacritic, and we selected Torchlight 2 as one of the best RPGs of all time—gives the studio a credibility that makes Hob worth keeping an eye on, even at this early stage. Runic will debut the game at PAX Prime, which runs from August 28-31, and until then you can poke around a bit at the new website up now at Hobgame.com.